After launching Sourcehunt Design last month, we are excited to bring you 5 new open source projects which could use a helping design hand. Right on time for Valentine's Day, share some love by donating some time to the following projects. There are some big name source projects this month, so having any of them on your resume will no doubt look impressive. This month we've selected some long-established open source projects, so expect mature systems and experienced project management. As always, check out the GitHub guides in case you are stuck with GitHub issues (although it should be pretty straightforward). 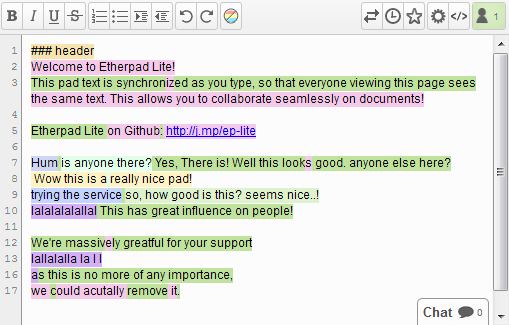 Etherpad allows you to edit documents collaboratively in real-time, much like a live multi-player editor that runs in your browser. Write articles, press releases, to-do lists, etc. together with others, all working on the same document at the same time. All instances provide access to your data through a well-documented API and supports import/export to many major data exchange formats. And if the built-in feature set isn't enough for you, there's tons of plugins that allow you to customize your instance to suit your needs. While Etherpad has no pressing need for critical design decisions, there are some important issues related to UI and UX on GitHub. Though Etherpad is currently a thoroughly useful tool, there's arguably room to make it more aesthetically satisfying. If you agree, step up, show us your chops and feel free to file issues or contact the developers. OsmAnd (OSM Automated Navigation Directions) is a map and navigation application with access to the free, worldwide, and high-quality OpenStreetMap (OSM) data. Equipped with a voice and optical navigator, the ability to view POIs (points of interest), manage GPX tracks and much more. It is currently the world's most popular open source map app for mobile, so contributing to it has pay off in valuable street cred. OsmAnd has recently updated their UI for Android going for a more Material Design-style, however it offers a lot of room for improvement. A perfect first task to work on if you want to get involved. Here is an example where you can contribute with some icons for the UI. I2P is an anonymous overlay network – a network within a network. It is intended to protect communication from dragnet surveillance and monitoring by third parties such as ISPs. I2P is used by many people who care about their privacy: activists, oppressed people, journalists and whistleblowers, as well as the average person. No network can be "perfectly anonymous". The continued goal of I2P is to make attacks more and more difficult to mount. Its anonymity will get stronger as the size of the network increases and with ongoing academic review. As of now, I2P is available on desktops, embedded systems (like the Raspberry Pi) and Android phones. On first sight, the entry level barrier to contribute with design in I2P might look pretty difficult, however once mingled in with the community, their design needs surface pretty quickly. I2P is looking to give its website a refresh, so if you are interested to give it a try, feel free to reach out to the team. VLC is a free and open source cross-platform multimedia player and framework that plays most common multimedia formats from DVDs to Audio CDs to VCDs and various streaming protocols. As one of the most used multimedia players (if not the most used), VLC prides itself as one of the most successful open source/free software projects in this age of capitalism. I personally cite it as one of my favorite examples when arguing the merits of open source software. VLC is also open for design contributions. You can contribute with VLC skins to the actual software, which can be a great learning curve. You can also contribute with Icons and Promotional Design, check out the Design page. Design improvements to the VLC website are also very valuable, so reach out to the VLC folks on the forum to get involved. VLC is not actively present on GitHub, but you can check their bug tracker to file or follow issues. Qubes is a security-oriented Linux distribution focused on user friendly security.It takes an approach called 'security by compartmentalization', which allows the user to compartmentalize the various parts of their digital life into securely isolated virtual machines (VMs). Think of this as a simulated computer and OS which runs as software on a physical computer. Qubes OS is one of those open source projects with a great focus on user experience and design. This is partly due to the involvement of Brennan Novak, a very active member of the Open Source Design organization from where Sourcehunt also took inspiration from. The project was founded in 2010 and provides a lot of space for designers to chime in. The UX issues on GitHub alone will keep good designers busy for some time. In fact, here is a good example of a design issue in Qubes OS. And if you want to contribute to the website, this issue might be for you. If you want to mingle a little and get to know the team before contributing, you can reach them also via their mailing lists. As always, make sure to read through the contribution guidelines of each project before contributing. Do not hesitate to reach out to the project's developers on GitHub, their mailing lists or IRC too. Did you contribute with design to any project? Let us know in the comments or use the #sourcehunt #design hashtags!